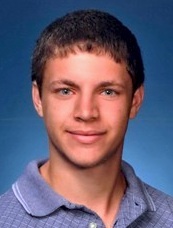 Justin P. Garrett, 23, passed away on January 24, 2016 at his home in Olathe, KS. He was born on October 19, 1992 in Kansas City, MO to Steve and Kathy Garrett. Justin was employed with Einstein’s Bakery as an Assistant Manager. He leaves behind his parents, Steve and Kathy Garrett, his sister, Megan Barrett, and brothers Jason Garrett and Nathan (Joseph) Garrett and his wife, Lisa, grandfather Salvatore Iannazzo, his aunts Nancy (Cliff) Vandenburg, and Sally (Mark) Melms, nephews Cory Woods and Jordan Garrett, nieces Kendalynn Garrett and Elora Barrett, cousins Beth Ann Melms, Rachel Melms and Matthew Melms. A Celebration of Justin’s life will be held on Thursday, January 28 at 3:00pm at Blue Valley Baptist Church Ridgeview Campus,1325 S. Ridgeview, Olathe, KS 66062 with visitation following until 5:30pm. In lieu of flowers, we beseech you to make the effort to reach out to the troubled souls around you who need a friend, and stick with them even when it is uncomfortable or inconvenient.